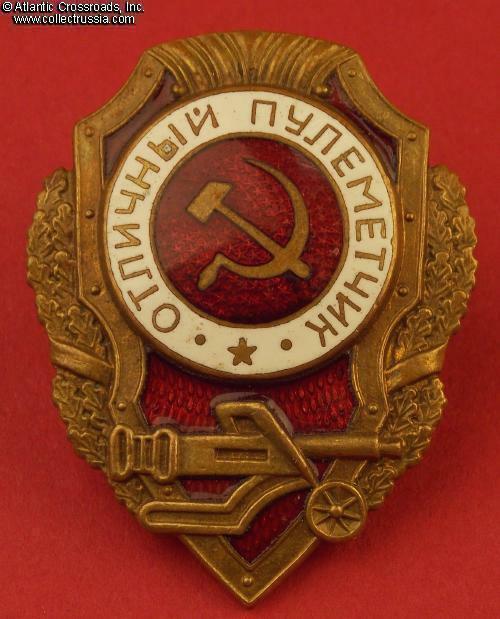 Excellent Machine-Gunner badge, MTKh version, circa early 1950s. 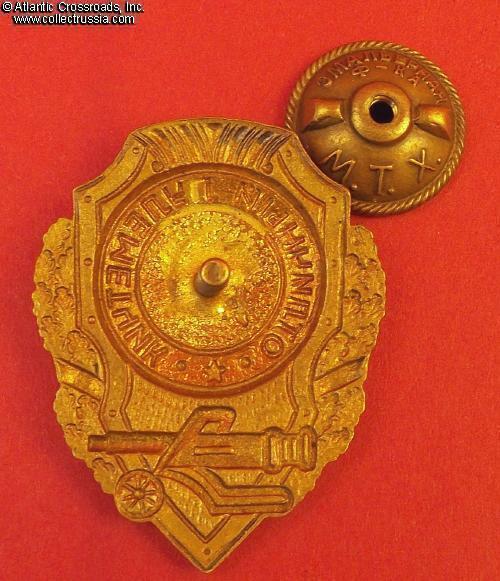 Brass, enamels; 46.2 x 36.2 mm. 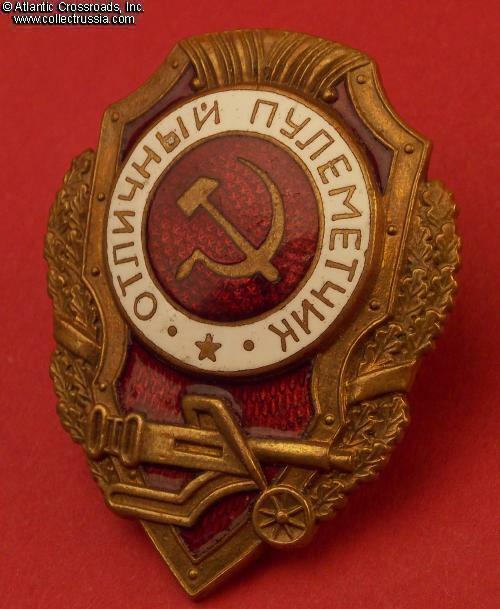 This relatively scarce version of the badge was manufactured during 1950-1953 by the MTKh (Moscow Artists Cooperative) workshop. 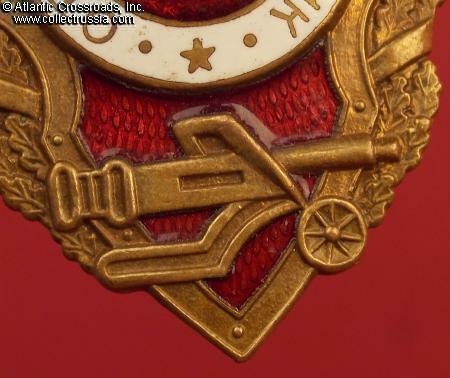 Features oval shaped handles of the machine-gun and strait edges of its shield; the scrolls in the ornament on the top of the shield are sharply defined and form a downward pointing triangle in the middle. This is the so-called First Unified type according to the Airapetyan classification. In outstanding, excellent condition. The enamels are essentially perfect, with some tiny contact marks and minor surface scratches, no flaking, chips or any significant wear. 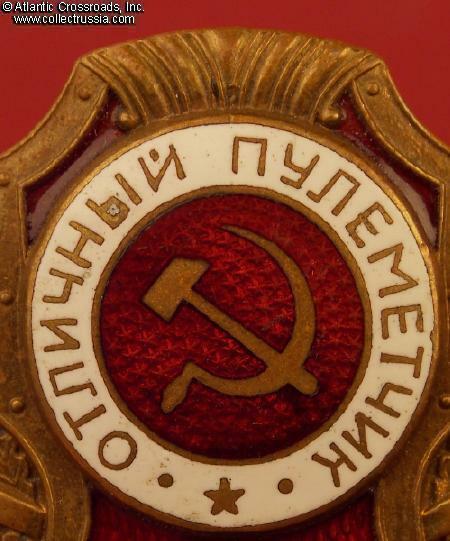 The red enamel retains beautiful luster both on the center medallion as well as in the lower portion of the badge. The details of the wreath and machine-gun are pristine. Some of the original gilt is still visible in the recessed areas on the obverse; even more of it remains on the reverse, especially around the screw post. 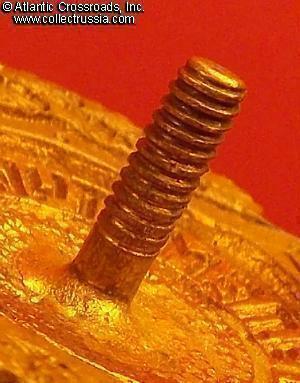 The screw post is full length, over 11 mm, and includes original screw plate marked "MTKh Enamel Factory". Overall, a superb example!